An American bald eagle hatched at the Citizen Potawatomi Nation Eagle Aviary in May to Kche Gizhek (Kyla) and Zagéndem-nené (Charlie) will be released thanks to special authorization from the United States Fish and Wildlife Service. The aviary staff recently confirmed the young eaglet was a boy, and he will be the first bald eagle to be hatched in and released from a Native American tribal eagle aviary. This will be the second eagle released from the aviary. 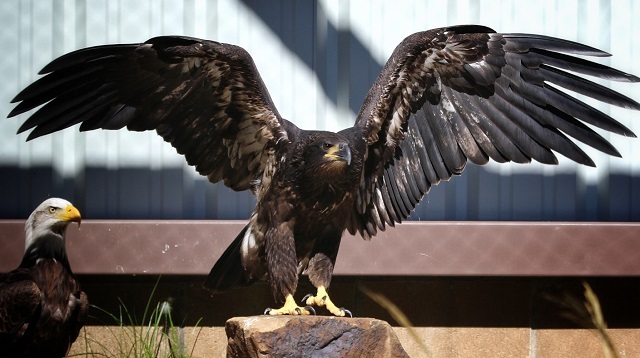 Wadasé Zhabwé, one of the first eight eagles to call the CPN Eagle Aviary home, was released in April 2013. Rob Domenech from the Raptor View Research Institute equipped the eagle with a GPS device so that her travel and hunting progress can be monitored. The transmitter will allow CPN to follow the movements of the eagle and is a way to keep track of the eagle to make certain of her survival in the wild. CPN is the first Native American tribe to use a GPS device to track a rehabilitated eagle. The new eagle will be fitted with the same technology so that the aviary staff can monitor his progress. The aviary staff anticipates that the eagle will be released before fall.